From one of Golf Digest's Top 5 teachers, a simple, scientific program to build a great swing! Most golf instruction is based on helping students emulate the best players, but for top golf teacher Mike Bender, physics provide a better model for developing a swing that is as efficient, consistent, and timeless as that of Iron Byron, the PGA robot that tests clubs and balls. Now Mike Bender shows you how to put the secrets of science into your own swing with a simple, proven program that will take your play to a different level and transform your approach to the game. Mike Bender teaches his unique biomechanical approach to build a simple, repeatable, and effective swing. He shares the same approach that he teaches his students, who include two-time U.S. Open winner Lee Janzen, PGA Tour winner Jonathan Byrd, and 2006 LPGA Tour Rookie of the Year Seon Hwa Lee. 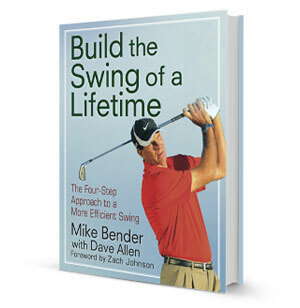 Building the Swing of a Lifetime includes a Foreword by Zach Johnson, 2007 Masters champion and one of Mike Bender's star students. You learn first hand, step by step, how to build your scientific swing. Included are 150 photographs to help you put principles into practice on the golf course. As Mike Bender puts it: would you rather fly in an airplane that was built by engineers who understood the principles of lift and acceleration, or would you rather fly in one built by people who simply went out to the airport and watched them taking off and landing? Once you develop a scientific swing, it's your own game that will really soar! Explains Mike Bender's unique biomechanical approach to building a simple, repeatable, and effective swing. Shares the same approach Bender teaches his students, who include two-time U.S. Open winner Lee Janzen, PGA Tour winner Jonathan Byrd, and 2006 LPGA Tour Rookie of the Year Seon Hwa Lee. Shows you how to build your scientific swing step by step. Includes 150 photographs to help you put principles into practice on the golf course. Includes a Foreword by Zach Johnson, 2007 Masters champion and one of Mike Bender's star students. Makes a great gift for any golfer!